(CNN) -- Tamil Tiger rebels have been pinned down by Sri Lankan government troops in a small section of the country's north, the Ministry of Defense claimed Tuesday. 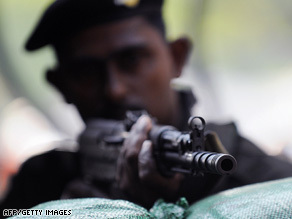 A Sri Lankan soldier guards a military checkpoint last week in the capital of Colombo. "Security forces have now cornered the remaining [rebels], including its most wanted terror chiefs," the ministry's Web site reported, saying the rebels are confined to less than 2 square miles (4.5 sq. km) of land south of Rektavaikkal. "Terrorists have suffered heavy beating from the security forces and now left in total disarray with successive loses of both ground and cadre," the ministry said. Among those trapped by the fighting, according to the army, is rebel leader Velupillai Prabhakaran, as well as some of his senior lieutenants -- surrounded by government troops on three sides and the sea on the other. Tens of thousands of civilians have been caught in the crossfire as government forces advance, although accounts vary widely. As recently as last week, a defense spokesman put the number at 10,000 to 15,000 civilians trapped in the conflict zone, while a rebel Web site, Tamilnet.com, said "reliable reports ... put it to more than 120,000." The Ministry of Defense said its forces are rescuing "civilian hostages" as they advance on rebel positions. The Tamil Tigers have been fighting for an independent state in Sri Lanka's northeast since 1983. As many as 70,000 people have been killed since the civil war in Sri Lanka began, and the group has been declared a terrorist organization by 32 countries, including the United States and the European Union. CNN's Iqbal Athas contributed to this report.